Gail Borden of New York, formerly of Galveston, Texas, is an eminent inventor, who has extended his explorations into fields comparatively untrod by others. His name came prominently before the public by his invention, in 1850, of a Meat Biscuit, containing in the smallest possible bulk all the nutritive properties of the beef or other meat used in its manufacture. The means by which he accomplished this consisted in combining a concentrated extract of meat with the finest flour, and thoroughly desiccating the mixture. Beef, freshly slaughtered, was boiled for a protracted time in a quantity of water, and, after the careful removal of all fat, the broth, separated from the meat, was evaporated by steam heat to a uniform density. This extract, resembling syrup, was then kneaded with the best flour, cut into biscuits, which were subjected to moderate heat in an oven, and then ground into a powder for convenience in packing and use. The Meat Biscuit reached the careful study of many eminent scientific men in this country and in Europe. Professor Playfair, after a prolonged examination, pronounced it an excellent article, retaining unimpaired the nutritive properties of its constituents. Dr. Solly used even more lauditory language. The report, accompanying the award of a Council medal at the Great Exhibition in London in 1851, says: "A more simple, economical, and efficient form of portable concentrated food than the American Meat Biscuit has never been brought before the public." Mr. Borden, however, entertained the idea that the extract might be perfectly preserved without the agency of the flour used in desiccation, and, after experiments for several years, in which he has been assisted by Mr. J. H. Currie, and Mr. S. L. Goodale, he perfected a process by which the pure broth, previously alluded to, is reduced to a solid form. The extract, as at present made, is a nut-brown substance of the consistency of caoutchouc, readily dissolved in hot water, forming a broth possessing the flavor of delicately roasted meat. The points in the process, which the inventor considers are of cardinal importance, are, 1st. Care in the selection of the beef. 2d. Great promptness in commencing the treatment after slaughter. 3d. Immediate and thorough exhaustion of the meat. By the use of the vacuum pan the liquid extract is evaporated at a low degree of temperature. A product which is so useful wherever an easily portable aliment is desired, has met with marked favor. Physicians employ it in the sick-room, as a ready means of making beef tea of definite strength, so that they can now prescribe this supporting agent with as much certainty of having a good article made as they have in regard to their ordinary drug prescriptions. The value of this extract in long journeys, by land or sea, is obvious, and its general use by explorers and tourists is not a matter of conjecture. As a means of so perfectly preserving the beef of the great producing districts of the West and Southwest, that the expense of transportation to the consuming cities is reduced to a minimum, this process becomes of national importance, and deservedly takes high rank among the valuable inventions of the century. While prosecuting his investigations in regard to the preservation of Meat, Mr. Borden became convinced that Milk could, by some process, be materially reduced in bulk, and preserved for any desirable length of time. Gail Borden used this copper vacuum condenser for his first successful milk experiment. Several preparations of milk had already been presented by scientific men to the public of France, England, and America, but the disproportion between their price and that of new milk prevented their general introduction and use. Moreover, many of these preparations contained foreign substances, designed to resemble those solid constituents of milk of which they bad been deprived in the process of manufacture, but these artificial substitutes fell far short of the caseine, oil, and salts of new milk in nutritive value. The successful method adopted by Mr. Borden, after a long series of experiments upon a large scale, was substantially as follows: The milk is brought by the dairyman immediately after milking to the factory, where it is subjected to a heating process preparatory to its evaporation in vacuo. It is then strained and drawn into the vacuum pan, and reduced to its required density by the abstraction of about seventy-five per cent of the water. That which is to be carried at once to the city is called plain condensed milk, end resembles a very tenacious syrup. That which is to be placed in cans is mixed intimately in the process with the best white sugar and hermetically sealed. This is known as Preserved Milk, and will keep in perfect order for a great length of time, readily dissolving in water after the lapse of years. This vacuum process, which had never before been carried out, obviates any practical difficulties that had discouraged those who had previously endeavored to condense or solidify milk. The high appreciation in which this article is held by physicians led to its immediate introduction into families in our large cities, and prepared the way for its very general use on voyages. During our late civil war, Mr. Borden's Milk was very extensively employed in the Army and Navy, and the concurrent testimony of soldiers and officers, of those who used it as a luxury and of those who used it in the hospitals, is of the most highly commendatory character. 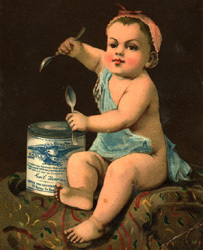 Several manufactories of this condensed Milk are now in operation in various parts of the country, the first having been located in Litchfield county, Connecticut. In 1860, more extensive Works were erected on the Harlem Road, Dutchess Co., New York, where three vacuum pans are employed, capable of working five thousand gallons of milk per day. The next important factory is at Brewsters, South-east, Putnam Co., with a large vacuum pan in which five thousand gallons of milk can be condensed in a day. Mr. Borden is also connected with a factory of a capacity of two thousand gallons, at Livermore Falls, Maine, and one of the same size at Elgin, Kane Co., on the Fox river, Illinois. Connected with the latter is a factory for the manufacture of the extract of Beef. Simultaneously with his experiments in the condensation of Milk, Mr. Borden undertook the preparation of a decoction of Coffee in such a manner as to preserve the fine aroma of the roasted berry. The extract prepared by him contains condensed milk and pure sugar, and is easily soluble in hot water. He also patented a process for the preservation of the juices of fruits, as apples, currants, and grapes, by which they may be reduced to one seventh of their original bulk, and are not then subjected to fermentation unless dissolved in water. The date of this patent is 22d of July, 1862. The great success which has crowned the studios of Mr. Borden in the preservation of Food, may be attributed to the fact that he was one of the first to appreciate the importance of taking measures to prevent incipient decomposition or fermentation. The full developments of the principles adopted by him in the manufacture of these new articles of commerce, has enabled him to preserve in their freshness and richness the most valuable nutritive liquids, and in such perfect manner as to cause tourists and explorers to consider them among the indispensable necessaries of their journeys, rather than mere luxuries. The value of these products is so highly appreciated that they are being very extensively employed for culinary purposes in families and hotels. The text above is an extract from the book A History of American Manufactures from 1608 to 1860 exhibiting the origin and growth of the principal mechanic arts and manufactures, from the earliest colonial period to the adoption of the Constitution, and comprising annals of industry of the United States in machinery, manufactures and useful arts, with a notice of important inventions, tariffs and the results of each decennial census by John Leander Bishop, Edwin T Freedley and Edward Young (1866). The graphics are from other sources as labelled. Borden's meat biscuit was his first invention, which preserved meat extracts and drew much praise in several articles in the Scientific American periodical. Borden's meat biscuit patent was titled "Preparation of Portable Soup-Bread," issued as U.S. Patent No. 7,066 on 5 Feb 1850. Military use of the meat biscuit was also recognized as highly suitable for meal rations, and was favorably compared in the Scientific American periodical against the difficulties experienced by other countries having to preserve meats for their military needs. Borden's condensed milk was his next great invention, which launched his very successful diary company supplying his Eagle brand milk to cities distant from farm supply, and was also recorded in several Scientific American articles. The condensed milk patent gives Borden's description of his method in U.S. Patent No. 15,553 issued 19 Aug 1856 - the first effective commercial process in the U.S. for condensing and preserving milk. Borden's fruit juice concentrating patent shows his continuing interest in preserving more types of food detailed in U.S. Patent 35,919, issued 22 July 1862, titled "Improvement in Concentrating and Preserving For Use Cider and Other Juices of Fruits." Competitors joined the market as shown in this Manufacturer and Builder article from 1878. A quotation - the epitaph from Gail Borden's gravestone.